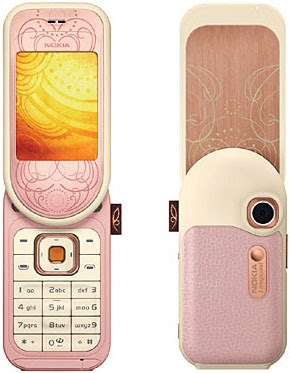 Just like the ranges of the major fashion houses, Nokia's L'Amour Collection of style phones gets updated once a year. This is perhaps the most interesting model in the new line-up as its screen rotates through 180 degrees. The handset is available for free on a contract with Vodafone or you can buy it SIM-free on the Web for around £170. 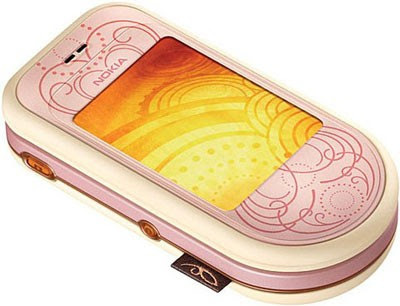 Nokia has certainly lavished plenty of attention on the design. There are some nice touches, such as the leatherette finish on the rear, a swirly pattern gracing the pink metallic finish on the front and a fabric label on the right-hand side. The screen, which swivels through 180 degrees to open, is also a real attention grabber. Continuing Nokia's fine tradition, the majority of the features on this handset are very easy to use. For example, texting is ace thanks to the intuitive messaging software and large, comfortable keypad. One of the benefits of the design is that when you put the phone into camera mode with the flick closed it actually feels like a real snapper. This is because you end up with the lens on the front and the screen on the rear. The 2-megapixel pictures it takes are reasonably sharp, but unfortunately there's no LED flash for shooting in low light. The previous line of Nokia's fashion phones couldn't be expanded with more memory, but thankfully there's no such limitation here. The 7373's microSD card slot, which is located under the battery cover, can accept cards of up to 2GB in size. Nokia supplies a 128MB card as standard, but if you're going to use the phone's music player you'll probably want something a little larger. Like skinny jeans or 6-inch heels, the flick design might look good but it's not exactly practical. The screen can be pushed either right or left to flick it open, but either way it's awkward to use and despite living with it for a week we never really got used to it. As a music phone, the 7373 is also missing a trick. The player works with MP3 and AAC files, but it's not very easy to use. Selecting tracks is clunky and you can only create a single playlist. At least if you get fed up of the music player you can always switch to the FM radio, which has pretty good reception. The sound quality from the built-in speaker is poor in comparison to the likes of Motorola's RAZR handsets and the supplied headphones aren't much better. They sound too tinny for our liking and just aren't loud enough. In fact, the sound was so low that on Tube journeys they were often drowned out by the rumble of the carriage. Unfortunately there's no standard mini-jack adaptor supplied with the phone, so you can't swap them for your own set of cans. The battery life could also be improved. We only got around two days of pretty average usage out of it before it gave up the ghost--that's par for the course on smart phones, but not so hot for a less advanced handset like this one. Nokia previous fashion phones were mostly a triumph of style of substance, and while this handset rebalances the scales somewhat, the end result is a still a pretty average phone. With so many great style phones now on the market, the 7373 struggles to make an impression. We'd happily pass over it for the likes of LG's Prada handset.